Create and Download Custom Marine Maps for FREE. GoFree - the provider of digital content and services and part of the Navico family of marine electronics brands including Lowrance, Simrad and B&G - announced today the expansion of its free award-winning and easy-to-use Insight GenesisTM automated marine mapping service to allow boaters to create customized maps for Malta. Insight Genesis empowers boaters with the ability to create contour maps of their favorite fishing and boating areas. Whether mapping previously uncharted waters or ensuring surveyed details are accurate and current, Insight Genesis delivers a new level of personal cartography and situational awareness for boaters. After creating a free account, users can create their own maps by following a simple three-step process ─ Record, Upload and Use. In addition to creating custom maps, users can access and download millions of acres from the community-generated Social Map, where other users have shared map data from all over the world. Because users continuously add content, the Insight Genesis Social Map provides the most up-to-date underwater view ─ displayed as blue-shaded maps ─ with a selectable range of high-resolution contours from 1 to 10 feet. Free and Premium features are available for boaters to create contour maps for use on most Lowrance, Simrad and B&G multifunction displays. To create marine maps with the highest available detail, users can upgrade to Insight Genesis Premium, which provides detailed vegetation and bottom hardness contours. To create an Insight Genesis account or download custom maps visit our website at www.insightgenesis.com . 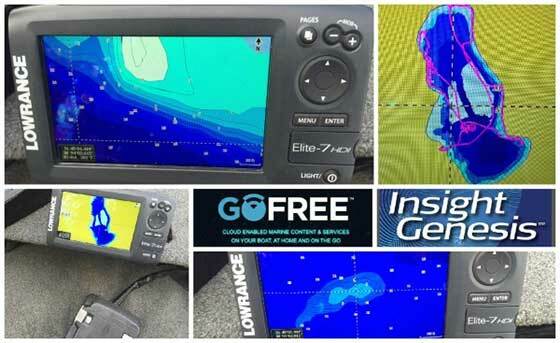 For more information on Insight Genesis, including the community-generated Social Map, GoFree or the entire line of Navico marine electronics, please visit www.gofreemarine.com or www.gofreeshop.com .